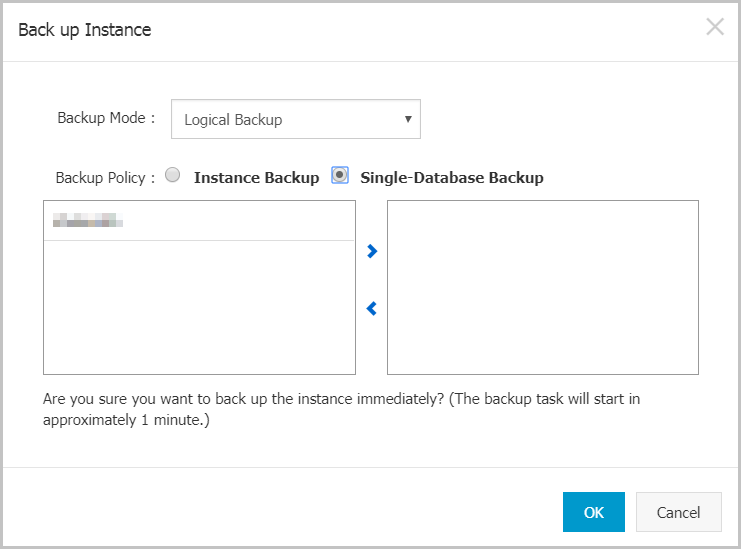 You can configure a backup policy to adjust the cycles of RDS data backup and log backup. As a result, RDS enables the auto-backup feature. You can also manually back up RDS data. Instance backup files occupy backup space. Charges are incurred if the used space exceeds the free quota. You must set a backup cycle appropriately to cater to the service requirements based on the available backup space. For information about the free quota, see View the free quota of the backup space. To view the charging standard for backup space usage, see Pricing. Automatic backup supports full physical backup. Manual backup supports full physical backup, full logical backup, and single-database logical backup. Supports only snapshot-based backup instead of logical backup. Backup files are retained for at most 7 days for free. After being generated, binlogs (500 MB per log) are compressed and uploaded immediately. Local files are deleted within 24 hours. Binlog files occupy instance disk capacity. Using the binlog upload function, you can upload binlog files to OSS. This does not affect the data recovery function and stops the binlog files from occupying instance disk space. Supports full physical backup and incremental physical backup. Automatic backup cycles from full backup, incremental backup to incremental backup. For example, if a full backup is performed on Monday, incremental backups are performed on Tuesday and Wednesday, and another full backup is performed on Thursday,with incremental backups on Friday and Saturday. If a full backup is manually performed at any time in the backup cycle, the next two backups are incremental backups. SQL Server always compresses transaction logs during the backup process. On the Backup and Recovery page of the target instance’s management console, you can click Compress Transaction Log to manually compress transaction logs. RDS automatically generates log backups (log files). You can set the log file generation interval to 30 minutes or the data backup interval. The interval does not change the total size of generated log files. The log backup function cannot be disabled. 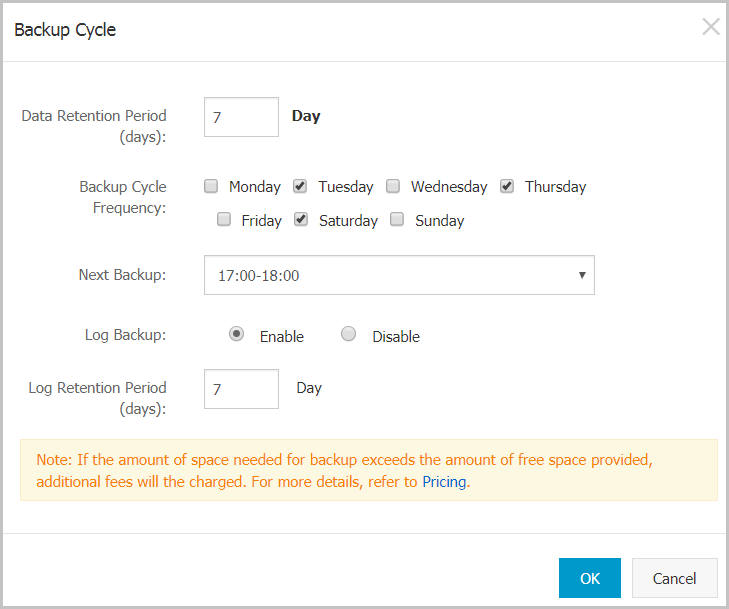 You can set the log backup reservation duration to a time period ranging from 7 to 730 days. You can download log files. PostgreSQL Supports full physical backup. After being generated, write-ahead logs (WALs) (16 MB per log) are compressed and uploaded immediately. Local files are deleted within 24 hours. PPAS Supports full physical backup. After being generated, WALs (16 MB per log) are compressed and uploaded immediately. Local files are deleted within 24 hours. Note The following uses MySQL 5.7 (High-availability Edition) as an example. Log on to the RDS console. Click the ID of the instance to visit the Basic Information page. Click Backup and Recovery in the left-side navigation pane. On the Backup and Recovery page, select Backup Settings and click Edit. In the Backup Cycle dialog box, set backup parameters and click OK.
Specifies the time period during which backup files are retained. The default value is 7 days. The value range is 7 to 730 days. MySQL 5.7 Basic Edition backup files are retained for free for at most 7 days. You can set it to one or multiple days in a week. SQL Server, PostgreSQL, and PPAS instances are backed up every day by default, which cannot be modified. Log Backup Possible values are Enable and Disable. Specifies the number of days during which log backup files are retained. The default value is 7 days. The value range is 7 to 730 days and it must be less than or equal to the value of the retention days. Select the region where the target instance is located. Click Back up Instance at the upper right corner. Set Backup Mode and Backup Policy. If you choose single-database backup, click > to select a database to be backed up. If you do not have a database, create one by referring to Create a database.